One of my favorite memories from childhood was when I was given a chance to design my very own dinner plate! All the kids in art class were given a white plastic plate and markers and told to draw whatever their hearts desired and then, wallah, through some magical process, our childhood art was turned into a dinner plate that you could actually use! Okay, I’m a little fussy on the whole process, but I remember my design like it was yesterday (a girl and a bird and the words “sing with me”)! It was the first thing that I thought of when I saw this wonderful child-designed cake from Soutine. 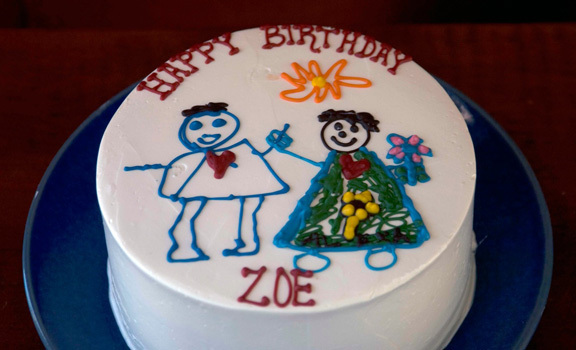 It’s such a fun idea for a child’s bday…let them create the artwork for their own cake. You could allow them to draw directly on the cake with frosting or with food markers on fondant. You could also have them put their doodles down on paper and then let a professional recreate the design. Such a cute and clever idea! To see more from the Soutine Bakery (NY), click here. That is such a cute idea! Just think how memorable the cake will be to the child, too, if he or she actually gets to decorate it. Now, that would make for the best birthday of them all.